Not Just Your Ordinary Deli! It’s always exciting when a new business or restaurant comes to your area! Don’t get me wrong, we have a wonderful selection of places to eat here at Deep Creek Lake and the surrounding area. You can choose some piping hot Brenda’s Pizzeria or maybe a steak and the famous creamy crab soup from Pine Lodge Steakhouse. The point is that we are certainly not lacking for some fine cuisine but adding another option certainly can’t hurt. When word began to spread last spring that there was going to be a new deli opening in McHenry, we were thrilled. Throw in the fact that it was owned and operated by a friend of the Taylor-Made family and we were even more excited! Owner Lora Lohr, originally from New York, said that opening Telli’s Deli just felt right. Having always been involved with food in some way, she felt that when this opportunity arrived, she knew it was too good to pass up! (Lora’s maiden name is Portelli, hence the Telli part). She wanted, “To be able to offer a different variety of foods that I like”. We apparently like the foods that she likes as well because if you haven’t had a chance to eat there yet, it’s a must! Our Taylor-Made crew has been the lucky recipient of a few catered affairs as well as ordering some of her morning bagels or sandwiches for lunch! When asked what made her food and business different from most, she stated, “Our freshness of product and quality of product are the best. Everything from our meats, cheeses, and produce are of the freshest.” They offer both breakfast and lunch and run specials daily. Fresh New York bagel breakfasts are very popular and the new egg sandwiches seem to be a favorite among locals! $8 lunch specials can’t be beat and are offered Monday through Friday. Lora and her team now offer an array of different options whether you want to come grab lunch and dine inside the cozy shop or have them cater your next function whether it’s a holiday party or just an office gathering. They also make some incredibly wonderful gift baskets. 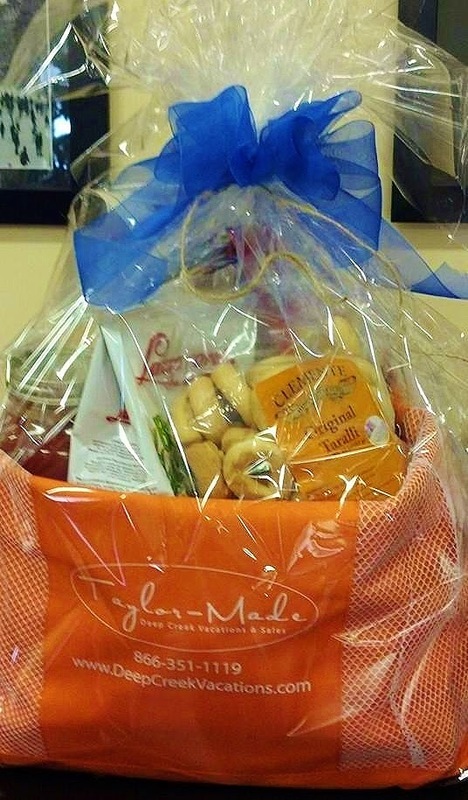 This has become a favorite give-away of us here at Taylor-Made whether it’s for the lucky winner of one of our many contests or a gift basket we send to a homeowner, they are always very well received. Finally Lora summed up by adding that one of the keys to the success of Teli’s Deli at this time is her wonderful supportive staff. “I am very fortunate to work with some wonderful women. We all work well together, love the food industry, and just enjoy what we do. We are all mothers so we pull together to work and be flexible and accommodating with our schedules. I have a great work family!” If you are in the area, please do yourself a favor and stop and grab a bite to eat at Teli’s Deli. You will be so happy you did! Wisp has been blowing snow lately preparing for opening day. We are still running our “Reserve 2 nights, get the 3rd night free” for another week so it’s a great time to take advantage. Give us a call here at Taylor-Made Deep Creek Vacations & Sales (1-866-351-1119 or online @ www.deepcreekvacations.com) and let us help you find that dream home! We can’t wait to see you at the lake! Previous Previous post: Staying on top of our game! Next Next post: Festive Times!